Preserve and retrieve older versions of files stored in your IBackup account. IBackup allows you to retain and restore previous versions of all files backed up to your account. Currently, you can restore 10 previous file versions to any location on your local computer. The additional storage requirement for the previous versions has no impact on your account's space, as your storage is computed only for the most current version; historical versions are stored free. 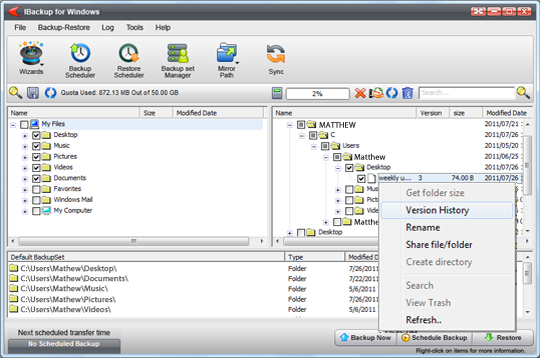 To retrieve a version, right click the desired file and select 'Version History' from the menu displayed. 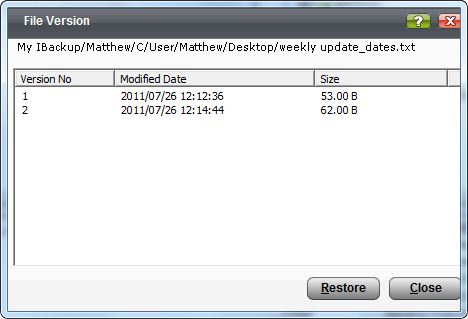 A list of the previous versions, stored in your IBackup account will be displayed. Select the version you wish to restore and click on the 'Restore' button.